How Does an Electric Wall Heater Function? When considering installing heating options in your home, electric wall heaters are an excellent solution to consider. Enabling direct heat in zonal areas of the house while saving space with on-wall or in-wall installation, electric heaters of this type can serve as a versatile solution to a cold home. However, make sure to consider the best options for you and the space you intend to heat. Here’s a little information on how to go about making the right choice. Electric heaters function in two main ways: forced-fan heaters or convection heaters. Forced-fan heaters tend to be very quick at heating a room due to their technology. A forced-fan heater works by moving the air in the room over a heating element. This heating element heats the air, which is then forced out by the fan to circulate around the room. As they heat the area very quickly, they are a great addition to areas that are not used so often, such as garages or workshops. Convection heaters work slightly differently, which makes them a little quieter than forced-fan heaters. Convection heaters draw cool air into the bottom of the heater. The air passes over a heating element, and its displacement causes it to move naturally, pushing hot air out as a replacement of cool air. Hot air rises, heating the whole space. Although they don’t heat a room up as quickly as a forced-fan heater would, these heaters are lower maintenance and far quieter. Taking this into account, people often use conventional heaters in sleeping areas as there is less disturbance. When choosing an electric wall heater, you need to first take into account the space you will be heating. If you are looking to have more on-the-spot heat blasting, then you are more likely to consider a forced-fan heater. 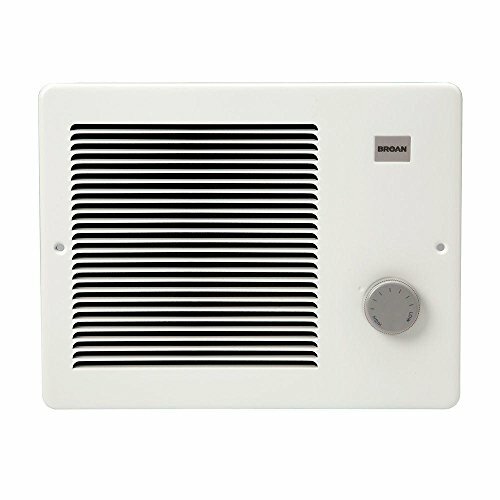 However, if you are looking for a smoother whole-room heat, a convection heater is far more suitable for the task. Secondly, it is important to consider the heating capacity. If you don’t have the correct heating capacity, you’ll find that the heater will struggle to bring the room to a comfortable temperature. As a general rule of thumb, 10 watts will heat one square foot of space. Make sure to measure your room first to ensure that you are selecting a heater with enough power. Next, consider the utility of the room. If it is a sleeping area, you will have to take into account the noise of the heater. 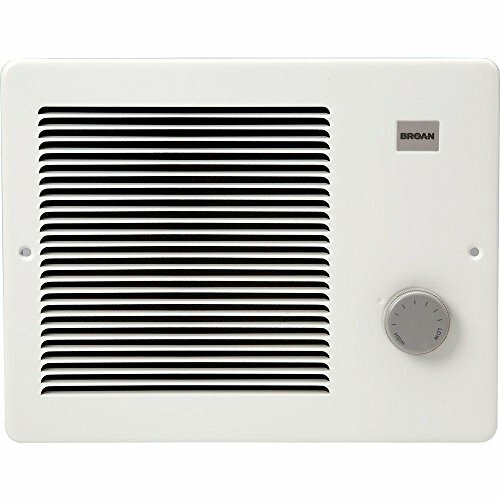 Forced-fan heaters can be a little loud and therefore not so suitable for light sleepers. However, if you are not worried about noise, if it's in the garage, try a forced-fan heater. Safety features are also vital to consider, especially if you have children. Some manufacturers have tip-over switches that turn the heaters off if they fall over. Moreover, you’ll find models that have cool-to-touch exteriors, as well as safety switches that automatically turn heaters off to prevent overheating, decreasing fire risk. Lastly, make sure to think about energy efficiency. Currently, there is no standardized measure for energy efficiency of electric heaters, but often you will find a rating to give you an indication of this. Electric wall heaters have a plethora of benefits, including, first of all, their ease of installation. 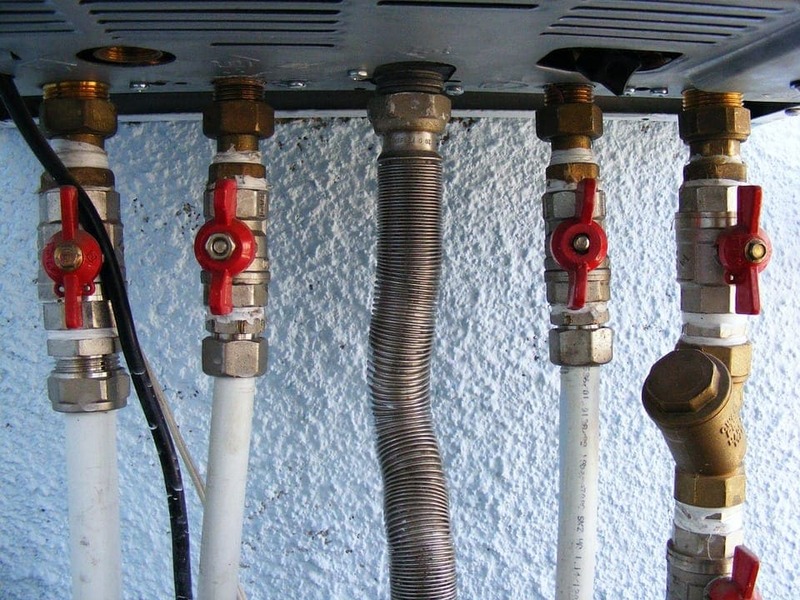 With gas heaters, often you will need professional installation to hook it to the gas lines. With an electric wall heater, you can plug it into the socket, and it will work instantly. Often mounting brackets are easy to install and take no longer than 15 minutes to put up. Electric heaters tend to have excellent safety features that prevent combustion. The tip-over and over-heat switches prevent it from getting too hot to cause damage, and most will shut off if something gets too close to it. Electric heaters don’t tend to take up much space. This makes them a great space-saving option, even in the smallest homes. Moreover, an electric wall heater saves space by being mounted on the wall, so it doesn’t take up valuable floor space. Equally, due to them being mounted on the wall, they heat the space much more quickly than heaters that are on the floor. Regarding costs, electric heaters tend to be cheaper than other heaters in terms of upfront payment. They are very durable and often have a lifespan of 8-12 years. Central heating systems are installed house-wide and allow for whole-house heating in one go. Central heating works with vents of radiators in each room, which serves to heat the whole house. Most systems of this kind run on gas and need to be installed by professionals, which increases the cost of implementing a system like this. 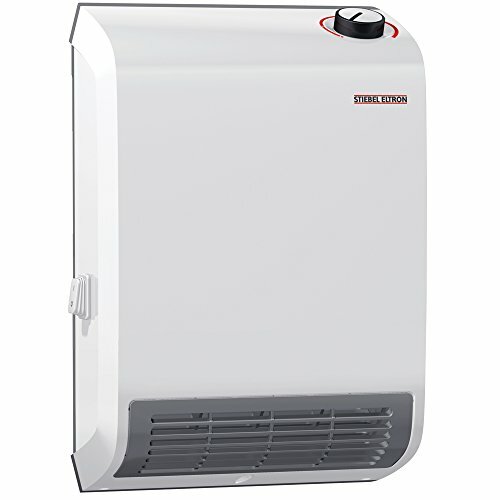 Electric wall heaters are mounted in each room and work by room basis, allowing for zonal heat. Whereas central heating only allows you to set the heat at one temperature across the whole house, electric wall heaters enable the temperature to be set per room, being much more versatile. Equally, electric heaters are far easier to install with no need of professional help. As wall heaters are room specific, you’ll find that you can only heat the area you are using, making it more energy efficient to use electric wall heaters. In the long run, you may also see your utility bills decline. The better option relies more on how you operate in your home. If residents tend to be spread around the house and don’t control heat, central heating is a good option. For those who want more control and versatility, or spend time in specific areas of the house, electric wall heaters are a better option. If you’re looking to install an electric wall heater in your home, you may want to consider the following products, some of the best on the market. Here are a few reviews to help you understand if they’re a good fit for your requirements. 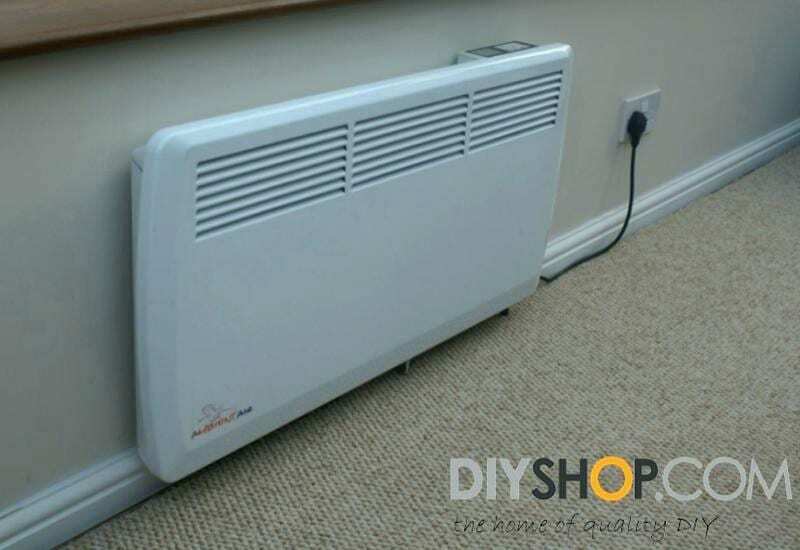 This heater operates at 49 decibels and features a ‘downdraft’ design to enable even heating. There is a built-in thermostat and a booster setting to enable quick heating for up to 60 minutes. It features 2000 watts of power and only weighs 5.5 pounds. It is very quiet, therefore, you can use it in the bedroom. Frost protection is included to prevent from getting too cold. The downdraft design means that it produces a more evenly distributed heat. This model is very light, and you can install it without having to reinforce the wall or find a stable one to put it on. The booster enables users to set the heater at a higher temperature (for up to 60 minutes) before the thermostat restarts. It allows heating a room more quickly. The wire is very prominently which is quite ugly. It isn’t as easy as it claims to install and many users needed help as the instructions weren’t clear. This heater can heat up to 200 square feet. It is an auxiliary heater and is not suitable for heating large spaces. A sleek design that can distribute even heating in a small room or a supplement source of heat in a larger area. The bonus features enable it to heat quickly and quietly. It is not suitable as a standalone product for large spaces. Users may need help getting it up and going, but once they do it, it works very well. 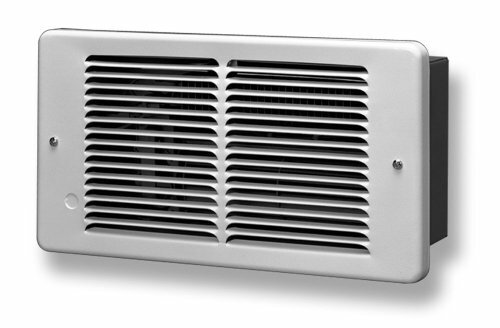 Made of heavy 20-gauge steel, this model has downward facing louvers for more evenly distributed heat. It has a baked enamel finish to increase durability while reflecting heat. It is factory wired at 1500-watts, at 120-v-AC, and can be easily converted to 750-watts at 120-v-AC or 1500-watts at 240-v-AC for added versatility. It can be recessed or mounted at the surface and comes with a built-in thermostat. The alloy heating element means it heats a room very quickly. The versatile wattage and voltage options enable installation in all different homes. The blower wheel is highly efficient and pushes air quickly around the room for better heat distribution. It can be installed at the surface or recessed into the wall for greater versatility and space-saving solutions. It is only useful as a supplemental source of heating and isn’t designed to take the place of a heating system. Users have complained that the thermostat sets the temperature too low and automatically shuts off before it heats a room. This heater is a great supplement to heat your home, but you can't use it on its own. However, it has different wattage and voltage, coupled with both surface and recess options, making it a versatile heating model. It is a forced-fan electric heater that features an efficient impeller-style fan with a nickel and chrome heating element. It has 2000 watts of power and can be installed into a wall mounted recess cage in less than 30 minutes. The downdraft provides even heating throughout the room. Easy enough to install if you have some experience and a wall recess ready for it. It features Patented Smart Limit Protection, which means that it disconnects the motor and the heating element if it overheats. It heats up very quickly, and the fan is powerful enough to push heat around the room, and increase the temperature in very little time. This model can be a little loud. It doesn’t have a thermostat, so you need to connect it to an external one. This heater is a great supplement to a heating system, with even heating technology. It is a bit loud, but a great option if you don’t want a heater with a thermostat. This force-fan heater enables you to choose the wattage for the specific heating requirements you have, from 500-2250 watts. It has easy-installation for wall recess mounting. 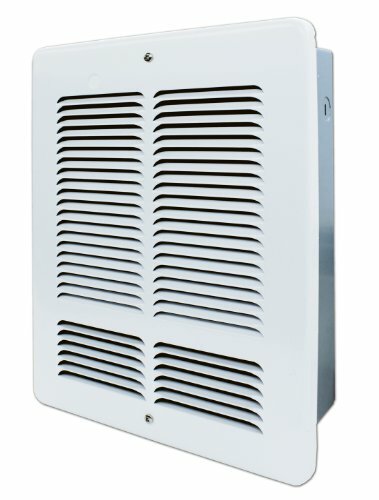 It features Smart Limit Protection and downdraft louvers. This model is very quiet. It has a variable wattage to provide versatile heating solutions. The Smart Limit Protection makes it a safety device to prevent overheating. The downdraft louvers enable more even distribution of heat in a larger space. You can use this model as a primary source of heat due to its high power capacity. This model needs an external thermostat to control the temperature. Some users have found that the spot welding on the housing wasn’t of high quality. It is a very high-rated model, that can be used to heat a room without another source of heat. However, remember that you need an external thermostat, otherwise you will need to turn it off manually, which can be inconvenient. With versatile voltage and wattage, it can reach 500 or 1000 watts. It features downward louvers and is made from durable 20-gauge steel coated in enamel. This device has an alloy heating element, and you can mount it as a surface heater or in a wall recess. It has versatile wattage that enables different power settings to increase heating. It is easy to install and can be put inside a recess or simply on the surface of a wall. This model is worth paying for in comparison to some of other more expensive models. The thermostat is not very precise. The thermostat is close to the heater, meaning that sometimes it shuts off too early. This heater has some great reviews and works well as a supplemental heater. It does not heat as high as other heaters but is easy to install and has variable options. Choosing the right electric wall heater for you depends on your needs. Consider whether you want something that needs to be installed into a recess or simply a surface heater that plugs and plays. It is imperative that you measure the room to understand the capacity you need, as well as thinking about what you use the space for. Don’t be caught short with a supplemental heater if you’re looking for a primary source of heat!